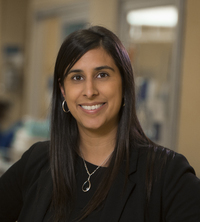 Laveena Munshi is Critical Care Physician at Sinai Health System, University of Toronto. She graduated from Dalhousie Medical School and completed her General Internal Medicine Residency and Critical Care Fellowship at the University of Toronto. She has research interests in critical care of the oncologic and immunocompromised patients with an early focus on hematologic malignancies and acute respiratory failure. She has recently completed her Masters in Clinical Epidemiology. Most recently she was supported by a Canadian Institute for Health Research fellowship. Her thesis work focused on evaluating the use of adjuvant therapies to mechanical ventilation in acute respiratory failure in North America and how evidence influences physician decision making. She has recently co-founded the Critical Care Oncology Investigative Network with her colleagues at Mount Sinai Hospital, Dr. Michael Detsky – a local collaborative initiative to improve and expand clinical, education and research endeavours within critical care oncology.